Our ad manager Tracey was part of the water patrol safety crew members during the Ironman swim. A beautiful day on the water. On the way out there on the Kalia, the Atlantis Submarine shuttle boat, a friend was turning green and quite seasick, she said she was ready to puke. Then I remembered that I had the Relief Band in my camera bag. I had her put it on, switch on the juice and immediately the nausea went away. She stood up, was walking around, even came up on the roof of the boat without problems. As she said, “this thing is awesome!” She was all smiles and happy. She didn’t want to take anti-seasickness pills she had to work that day and didn’t want to be knocked out. Another good test of the Relief Band, you can get it at Aeromedix . 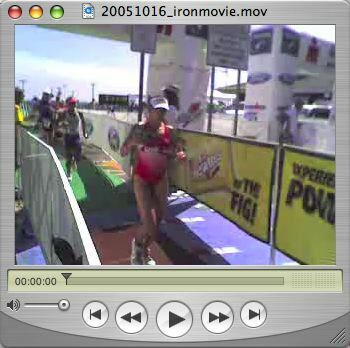 Triathletes head out of the transition area onto the marathon leg of the Ironman race, click on the above image to see the video. Via my Treo 650 cellphone. The calm before the crows at the finish line of the Ironman Triathlon. 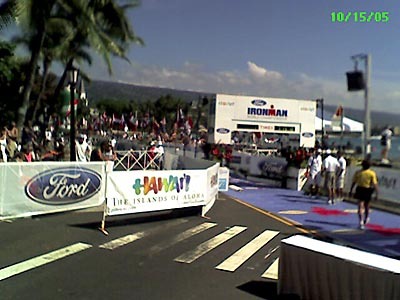 Crowds weren’t as big this year for the 1st place finishers but swelled later to cheer in the non-elite triathletes. Guess people waited to just go down to the finish for their family members and friends. Plus it’s later at night when they throw all kinds of freebies out into the crowd. Delly Carr and myself at the finish. 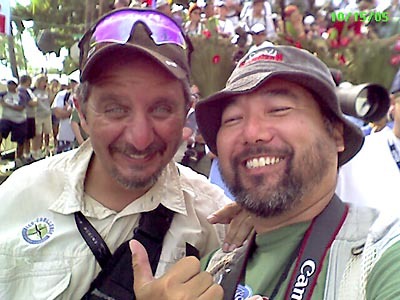 Delly is one of the HIP (Hawaiian Ironman Photographers) who makes the trip from Australia for the race.